Do you plan to set up a hot chocolate bar this holiday season? It was one of my favorite holiday projects last year, and I definitely plan to do it again this year. I’d recommend getting these printed at an office supply store such as Staples since they take up quite a bit of black ink. Or you can print these labels instead which are perfect for white or kraft cardstock. I had printed mine from home due to being impatient which is why they look a little rough in the photos. Woops. 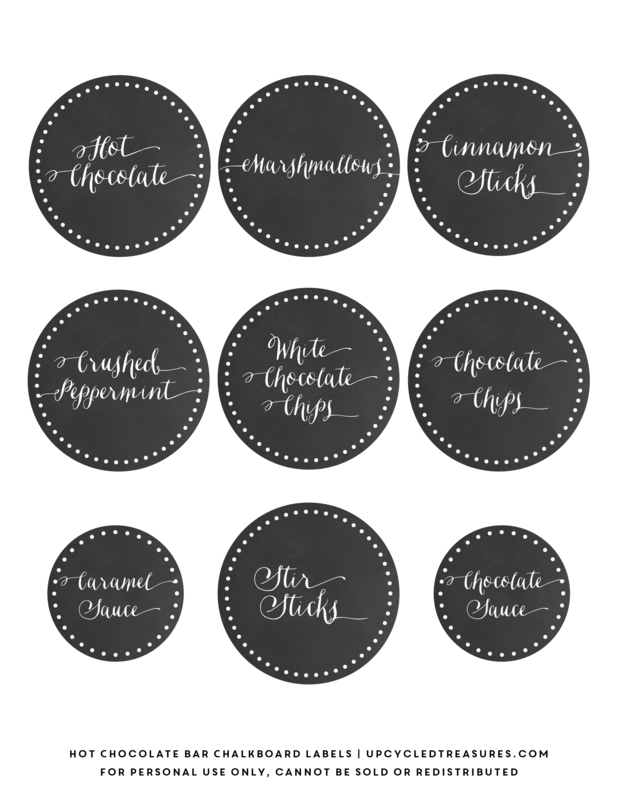 Simply print and cut these out, punch a whole in the them and then tie pretty ribbon or twine around the containers that hold your hot chocolate bar toppings. I placed most of our toppings inside mason jars and then used red and white baker’s twine for a more cohesive look. Click Here to check out the rest of my hot chocolate bar. Need a larger “Hot Chocolate Bar sign” or one that says “Hot Cocoa Bar” or “Hot Beverage Bar”? I now have them available in my shop, along with a silver/white version AND over 60 labels! What cute idea! I’ve never seen a hot chocolate bar before but I would love to host one. Thanks for the printable labels! LOVE this! I love free printables and hot chocolate, so this is just perfect! Sating hello from moonlight & mason jars! Hello cute lady! Super cute idea. Pinned and tweeted. Jessica picked this as her favorite post and we will be featuring it at our party tonight at 7 pm. Woo Hoo! I hope to see you there. These printables are too cute! Love!!! Oh my gosh, too cute! I do a hot chocolate bar every year for Christmas Eve. I’ll definitely be downloading your printables! Ps I like the “rough” look, it really looks like chalkboard! I love these and I am wanting to do a hot chocolate bar for my wedding! I easily downloaded and saved the Hot Chocolate Bar sign and put it up on Staples to get printed! I am having a harder time with the transition from the download to the Staples print website. They aren’t fitting? Have you had anyone have this problem before? I’m not the best with technology! Do you have any suggestions? Thank you! Hmmm, I’m not sure what’s happening but you may want to just put the image onto a flash drive and take it in. What size are you trying to print on the Staples site? Just make sure you are clicking on the image to be taken to the high res image and saving that one. Let me know if you got it figured out. These are awesome. Thanks so much for sharing. LOVE! Thank you. What is that font?? Love these! Can’t wait to use them for our gender reveal party 🙂 what font did you use for these? Thanks Erin! I used a paid font called Ondise and I link to it towards the bottom of the post. I love it!